In my world of nursery, diapers and play dates, spirituality often comes to me at random moments. These moments are fleeting, and despite my efforts to make them last or to repeat them, they simply disappear. It’s not that I’m not taking the time to connect with G-d, although I could put in more effort in that area, it’s that my mind is always in multiple places at once and I feel as though I can never make these moments truly meaningful. Sometimes, though, there are little moments that absolutely take me away. On Friday, the second day of Sukkos, I experienced such a moment. That morning, my sister had left to the hospital to deliver her 3rd child (ka”h). The day of waiting at home was an anxious one, as we could not contact my sister or brother in-law because it was Yom Tov. It was also a crazy busy, oh-my-g-d-I-am-never-having-two-sets-of-twins one, as I found myself acting as a second mother to her two children who are close in age to my own two children. With naps and tantrums and snacks and bathroom reminders, it was as un-spiritual of a day as it could possibly be. About an hour before Shabbos, my brother-in-law came rushing through the door. The labor was not progressing as expected and he needed to prepare food and anything that they would need before Shabbos started. As he left back for the hospital he asked me, “Can you please light candles for your sister tonight?” I immediately said that I would, but I remained standing at the door staring after him, long after he had gone. I don’t know why I couldn’t move. I don’t know why it meant so much to me. I didn’t have so much time to think about it because there were four kids who needed to get into pajamas; two of whom were not thrilled to be sharing their Mommy and Tatty and two of whom were missing their Imma and Abba immensely. And then it was time to light. I carefully helped the two older girls step up to the table and light their candles. And then it was my turn. My sister is more to me than just a sister; she is also my best friend. We have done so many things for each other over the years. Some incredibly embarrassing (how exactly is a kallah supposed to pull up her stockings when her nails are wet?) and some just incredibly special (she was there with her own two kids helping me while I went through postpartum depression); but nothing felt as enormous to me as this. 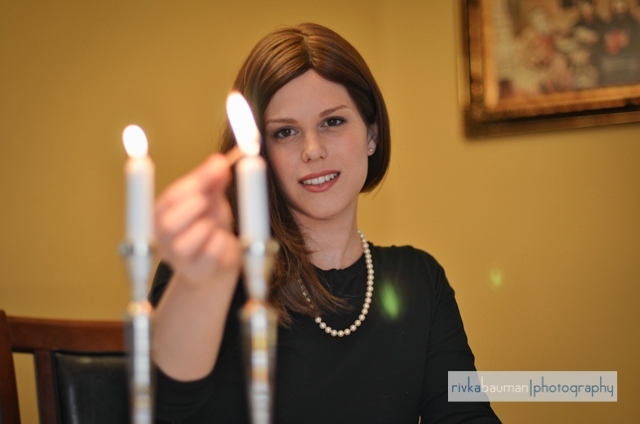 That evening, my sister entrusted me with a Mitzvah that is so uniquely special to her and to her family. She entrusted me with their Neshamos and with the light that is her duty to bring into this world. To my dear sister, I hope I did you justice. I couldn’t tune out the giggles, and whispers, and whines from the kids, so I instead allowed that to be the background music as I davened for their growth. I davened that they should continue in the way of Torah as you and I do and that one day they should cover their own eyes and bentch licht for beautiful families of their own. I davened that they should have as special a connection to their siblings as we do with each other and that they should always be there for each other in the best of ways. And I’m not gonna lie. I davened that they would all go to bed nicely too. Tonight, I am back at my house and you are at yours. We will be lighting our own candles miles away from each other, but you have helped to make my experience more meaningful. I think of that now; I think of the night that I lit eight candles, the night that I was forced to connect to Hashem in a more meaningful way because I was promising to do your part for you. And so, most of all, I will pray that with our candles, we will be able to fill the world with the ultimate light of Moshiach.